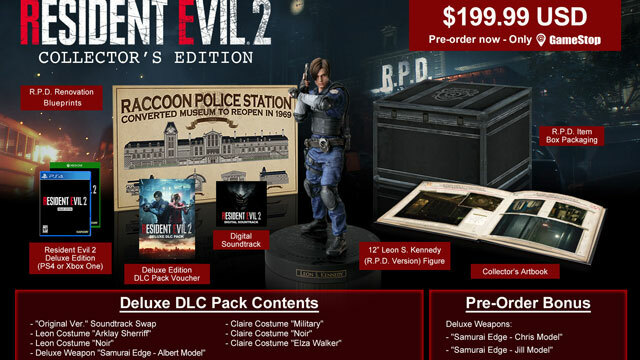 The remake of Resident Evil 2 is going to come in a Collector’s Edition, if you like that kind of stuff. It comes with a ton of both digital and physical items, including costumes, a figurine, the soundtrack, and art book, etc. In North America, it will be exclusive to GameStop, and cost $200. The remake of Resident Evil 2 is going to be a completely different game than the original RE 2; it’s definitely much more than a simple remaster. And, of course, Capcom is going to try and cash in as much as possible, and therefore, the Collector’s Edition of the RE 2 Remake. By the looks of it, it’s only coming out on the PS4 and Xbox One. In North America, the bundle will be exclusive to Gamestop, and cost $200 (or $240 CAD). As for Europe, more information will be coming out later. Let’s see what you get for your money. The first thing is “special deluxe packaging,” meaning the box looks like an R.P.D. item box. Then, of course, there’s the full game itself. Now, we get into the extensive Deluxe DLC content. There are three costumes for Claire, and two for Leon. You also get the Samurai Edge – Albert Model deluxe weapon, and the option to swap in the original soundtrack instead of the new one. Then, of course, there’s the preorder bonus, which is basically two more versions of Samurai Edge: Jill and Chris. Now, let’s go through the physical items and non-game digital stuff. First off, you’ll get a 12-inch figure of Leon, wearing his R.P.D. uniform. Next up, there’s the 32-page art book, called “Ben’s File” Art Book, alluding to the freelance journalist Ben Bertolucci from RE 2. Inside, you’ll find “photos and files documenting events after the Raccoon City tragedy, and was filed away as a highly confidential document by the U.S. government.” Next up, there’s a poster of the R.P.D. building, detailing how a museum became a police station. Last, but not least, is the digital soundtrack, containing 25 tracks, featuring both new tracks and original ones.